PowerProduction Software has introduced many advancements in storyboarding software and we’re excited to be back at SkillsUSA for the third year in a row to help students in their pursuit of digital media education. The 47th annual National Leadership and Skills Conference is in Kansas City this week for a showcase and competition of students’ work from across the United States. Armed with StoryBoard Quick, the Video Production competitors have a head start on the clock by designing their storyboards alongside their productions with time to spare. 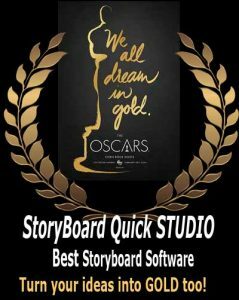 StoryBoard Quick’s wealth of included artwork and ability to import digital images is crucial for such a time-crunch, when the students don’t have the time to laboriously hand draw their storyboards or hunt the web for passable graphics. It’s easy to see how StoryBoard Quick can dramatically impact the success of a student’s film when these stunning Characters, Props, and Locations are teamed up with Quick’s easy-to-use interface, caption features, director’s tools, and presentation options.